Did you know that a single human being makes about 1 light year of DNA during a lifetime? Because the DNA is under constant assault, for example by sunlight, or by errors in DNA synthesis it suffers often damage. If not repaired, the damage can lead to aging, cancer and genetic disease. One important way to fix the DNA damage is called 'homologous recombination'. A damaged DNA sequence needs to find its counterpart with complementary, but intact sequence. 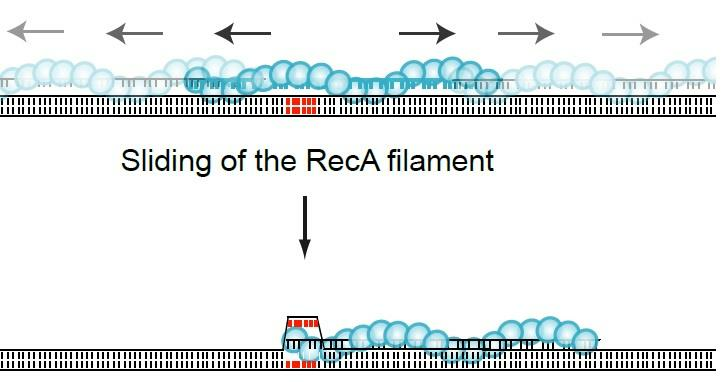 A filament of protein called RecA formed on the damaged DNA mediates this process, but it has been unclear how RecA finds the complementary sequence in the sea of millions of possible DNA strands. Researchers led by Prof. Taekjip Ha reported in the inaugural issue of open access journal eLife, (jointly sponsored by Howard Hughes Medical Institute, Wellcome Trust and Max Planck Society) that RecA filament slides on DNA strands and this one dimensional search can make the search for the matching sequence up to 200 fold faster. Scientists in Columbia University wrote an accompanying commentary and posted a stop motion animation on youtube. Journal Cell highlighted the paper in their Leading Edge section on Genome Instability. You can also learn more about the work from U. of I press release and from watching an Aspen Public Lecture by Professor Ha.